Single crystals of alkali halide inorganic scintillators are useful as nuclear radiation detectors in gamma-ray spectroscopy and radiography applications. These crystals are grown in silica crucibles using the vertical Bridgman technique. Crystals of NaI:Tl coupled to photo-multiplier tubes have exhibited excellent energy resolution of less than 7% at 662 keV, suitable to be used as radiation detectors in gamma-ray spectroscopy applications. 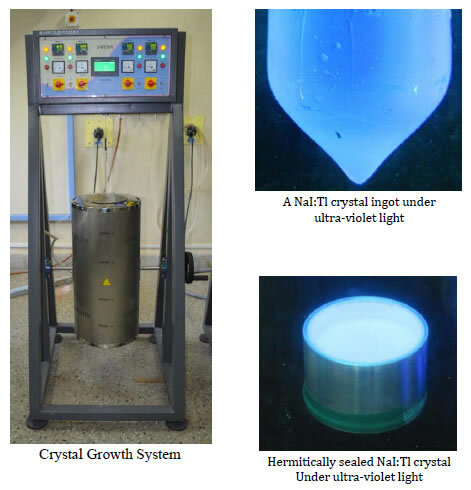 BARC has developed a novel crystal growth system based on the modified Bridgman technique to grow high quality, crack-free single crystals of NaI:Tl. Easy extraction of the grown crystal is achieved using a uniquely designed silica crucible and an ingenious furnace design that has precise temperature control mechanism and highly accurate motor for lowering the crucible. Single crystals of NaI:Tl up to 50 mm in diameter and 60 mm in length could be grown with almost 100% yield. The technology also covers processing of the grown NaI:Tl crystals and fabrication of scintillator detectors using photo-multiplier tubes (PMT). One B.Sc. (Physics) and one M.Sc. (Physics) or equivalent degree.